We had yet another snow day today, this is our second one in two weeks. Snow days mean that Little Andrew stays home from school while Adam and Jack are only on a one hour delay. Early head start has to offer a specific number of days of school per year, hence the delay instead of cancellation. Before knowing about the snow day, I had every intention to deep clean different rooms of my house since I would be home alone for six hours. Then I got the phone call about the cancellation and had to re-assess. Since Andrew is my oldest kid, he’s pretty good at entertaining himself. I decided that I would work on at least one room and if I got that done, then that would be enough. Since I’ve been single momming for seven months now, I’ve come to realize that I can’t do everything in one day. Accomplishing small things in one day has been satisfying. 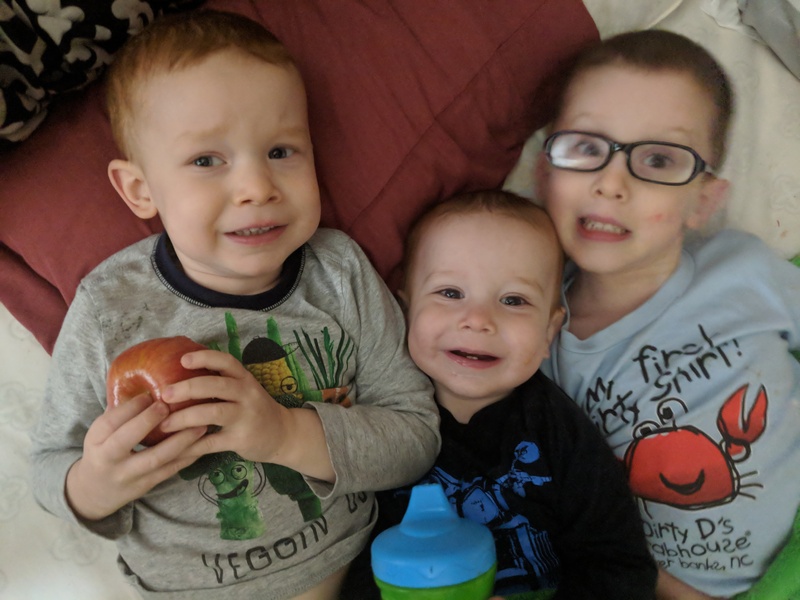 This morning, I decided I would get the boys breakfast and ready for school, take Adam and Jack to school, then come home and figure out what cleaning I would get done today. On the way home from dropping the boys off, Andrew told me that he’d like to play with the Pokemon figurines he got for his birthday the year before last (found on Amazon here). Since they’re very small, he’s not able to play with them much when his brothers are around so I figured it was a good idea. When we got home, he played with his Pokemon while I drank an iced coffee (I drink the 2X energy found on Amazon) and figured out what I wanted to get done today. That’s when I walked through Adam and Andrew’s bedroom to go brush my teeth (our house has a very weird set up) and realized that it looked like a tornado blew through. So Andrew and I did some learning (handwriting, sight words flash cards, and Spanish flash cards), watched Hercules, made lunch, then went to clean their room. It only took us about an hour to completely get rid of the trash, put the toys and books away, and vacuum. Having their room spotless is such a big relief and it makes me want to clean more every day. All 3 boys are officially in school and doing great. Jack started in the 1 year old classroom in late September, he’s taken to it amazingly and loves his teachers. Adam is in the 2 year old classroom and every morning he looks around to see which of his friends aren’t in school that day. Andrew goes to Pre-K and rides a bus to school every morning and loves every minute of it. None of them have had any real issues at school, which makes me feel awesome every day. We’ve had to walk to school for about 2 weeks now. On October third, I ran a stop sign and we got hit (everyone is fine), so our car is in the garage until hopefully mid November. It’s about a .7 mile trip to school one way, so I end up walking about 3.5 miles in a day, most of the time while pushing a double stroller with 50 pounds of child in it. When October started, I started the Last 90 Days challenge that Rachel and Dave Hollis have, which contains working out 30 minutes a day along with a few other things. I didn’t expect something huge to happen causing me to workout almost daily, but I guess it’s the universe’s way of helping me workout. But I have lost 2 pounds and 2 inches, so something is working right. It’s time to get ready to go get the boys from school. I’ll be trying to post more often than usual. It’s Been Almost A Year! It’s February of a new year and my goal this year is to write on this blog a lot more than I have in the past. Ideally, I’ll do a blog a week but realistically, once a month would be awesome. Our family grew by one in August. We’ve added another little guy into the family, leaving me as the only girl yet again. I really should get a girl dog or something. He’s almost 6 months old and is so loved by everyone. He’s a people lover and he’s starting to find his voice lately, which is wonderful to see. I’m halfway on a low carb diet this year. I’m not being a huge stickler about it, but I’m attempting to eat less carbs. I’ve lost about 5 pounds in the last 2 weeks, which is awesome but I’ve still got quite a bit to go. When I was pregnant with #3, I gained 50 pounds, which is almost more than my older 2 combined! If I had gained 5 more pounds, my weight gain would’ve been equal to my previous 2 pregnancies. That’s just crazy to think about.